Happy International Women's Day! If you were able to, I hope you supported #DayWithoutAWoman in some way. Onto my regular outfit post. While I really liked the way both of these outfits looked, I didn't enjoy wearing them so much. Shorts and a long sleeved top is a combination I really like wearing, and button up (or button down) shirts are perfect for breastfeeding. A Queensland summer heatwave is probably not a good time to wear such warm pieces though! Poor judgement on my part! I deliberately picked out this warmer top to wear on a hot day as the morning was spent with appointments and more tests for baby boy. Needed something I could easily breastfeed in that would keep me warm in the freezing aircon. It was a good idea to cope with all the airconditioned buildings we were in, but it was so insanely hot getting out the car to walk into a building that I was regretting my outfit choice a little! I also forgot to add a teething necklace on the way out the door. It's not the first time I've worn this printed shirt this red bag, I really like the pop of colour it gives. Despite overheating a little when I stepped outside in this, I really did love this outfit and I'm keeping it in mind for whenever the cooler autumn weather decides to arrive. Last worn: Ray-Ban Wayfarer, mixed print shirt, denim shorts, Rebecca Minkoff gladiator sandals, Rebecca Minkoff saddle bag. Other ways to wear: mixed print shirt layered for the office, denim shorts and print mixing, 30 ways to wear Rebecca Minkoff gladiator sandals, Rebecca Minkoff saddle bag in winter. You can see how old these pics are as Cooper's still all fluffy! 😂 I liked this shirt worn untucked with shorts here better than I did when I wore it last time tucked in. While it was a warm day I was eager to wear this shirt again. When the power cut at home and there wasn't any more aircon I was again regretting my decision to wear such a warm top on such a hot day. Luckily we didn't spend much time at home as we were going to stay down the cost with my parents for a few days. They had fully functional air conditioning thankfully, just what you need for a heatwave. I bought this shirt back in the Jeanswest sale in November, but didn't get to wear it much over December with baby boy's hospital stay. I figured it would be one of those pieces I could wear for both office wear and SAHM life. It really hasn't been worn often though. I do think it's a nice shirt, and I'm glad I bought it, but it really won't get worn much until the weather cools off. I did order a trench coat in that Cyber Monday sale that I've kept and still haven't worn though, so managing to wear this shirt twice isn't too bad! I am looking forward to wearing this again, when it's not so hot. Last worn:Ray-Ban Wayfarer (above), navy textured shirt, Bermuda denim shorts, Havaianas, Balenciaga tempete day bag. Other ways to wear: navy textured shirt tucked in, Bermuda denim shorts and embroidered tank, Balenciaga tempete day bag and printed dress. Button up shirts don't have to be reserved for office wear. They look great worn casually with denim and work nicely with denim shorts - if the weather's right! Linking up with What I Wore, Fashion Files, Fabulous Friday, Weekend Wear, Flashback Fashion, Friday Faves, The Ultimate Rabbit Hole. It is rarely so hot here that a shirt like this would be too much, but I can imagine that the aircon vs heatwave scenario makes dressing difficult. In Germany that usually means that I throw on a cardigan for being indoors. Happy Women's Day, I am hopeful we can come together to deliver a message that is full of empowerment and highlighting issues facing women. Love the post, have a lovely day. Yes it's a good day to highlight the issues when it seems more people are paying attention! Oh heat is making us insane here too Mica ! in fact we've had several days without a/c (damaged) and had to leave work early as it was unbearable. I don't know how you work without the AC. Would be impossible for me! I hate when air conditioning and the outside temps are so different it makes dressing really hard. I think the longer sleeved tops and shorts look really good on you! I hope baby boy is doing well. Did you do a post with a full update on what is going on somewhere that I missed? Love the print mixing in that first look!! Such cute looks!! That red bag is amazing! Denim shorts are always a great idea! I can't wait until it gets warmer here so I can wear mine! Happy women's day to you too! Loving your first outfit, the shirt and that bag are so pretty! I was all about button down tops when I was nursing. Cute outfit! Happy IWD! I'm wearing red to support my sisters, and happy to see you with your red bag. I will send you some cold if you send us some heat - bargain? I would love to see the shorts vs. pants ratio in your closet! Love the top in your first outfit. Dressing for the heatwave and airconditioned buildings at the same time can be quite confusing. Happy IWD! I actually didn't know about a day without women strike! I learned something new. yes, shorts and long sleeved tops or shirts is a combo I like a lot too...but as far as I remember, I only wore it for summer evenings. I imagine that it must have made you feel rather hot with that heatwave and all. Right now, it is still not very warm here, but I know that in Summer I sometimes get a cold because of the temperature difference between air conditioned rooms and the outside- where it can get pretty hot. It is hard to dress for two climates. Some places really take it too far with their freezing air-conditioning ways....but you look lovely in both outfits! How did the tests and check outs go? Is baby boy doing alright? Thank you - glad I could share more about the strike for you! :) Baby Boy is doing better, thanks. I love the look of long sleeves with shorts but if it's super-hot, it can definitely be uncomfortable! I love that red saddle bag! I know I always find a pretty Rebecca Minkoff bag every time I visit your blog and this red saddle bag didn't disappoint, it's really cute. haha yes I have so many of her bags! I love the print and style of your top in the first look! I hate dressing for extreme temperatures--if it's hot outside it's always super cold inside, or vice versa. Thank goodness for layers I guess :) Have a great day! Yes, layers are what I should have done! It doesn't get quite as hot here as it does near you, so I love lightweight longsleeve tops with shorts for chilly AC! It's a great solution for summer days when you are in and out of AC. 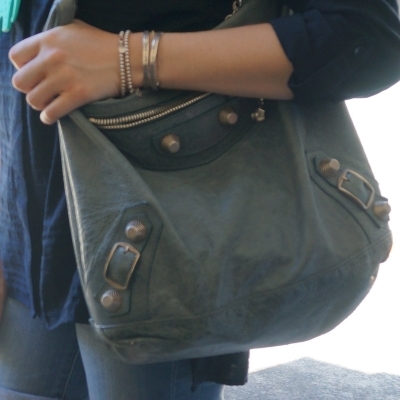 Love the way your grey top looks with your red bag! Love both of these looks! Casual and chic! Your red bag is beautiful!! Both outfits are really cute, I love the look of button up shirts paired with shorts, it helps to dress up the shorts a bit so effortlessly. I really love the sandals in the first outfit especially, they're so stylish and remind me of the Valentino rock studs; I need to get these! Thanks for sharing and I hope you're having a great week so far! They are much more affordable than Rockstuds too! very nice looks! and happy past International women's day! I like your bags here a lot, both look very girly and seeing it alongside shorts taking the whole outfit to different lvl. very nice! Blouses like this are ideal for having in your wardrobe come transitional seasons! I love your bight red cross body bag, by the way - so lovely! Yes, they are perfect for cooler weather! I have serious bag envy everytime I look at your blog posts. That Balenciaga would match everything and that red saddle bag is the perfect pop of color! I hope you're having an amazing week so far! haha I do love my bags! Both super cute looks, I can't wait for warmer temps here so I can finally start wearing my spring clothes! These outfits look so comfy and easy to wear. I love the first top. Looks a little boho-ish :) I've heard you're having some serious heat down there. Hope you stay cool! Thanks, we made it through the heatwaves! Its always so hard to dress in the summer when you will be in and out with air conditioning blasting. Love the look of long sleeve tops with shorts! Both of these are so cute! Yes summer dressing is tricky! You sure can rock a button up shirt. I don't know how you do those Queensland summers, especially without air con. I take my hat off to you! I didn't buy a thing! Aren't you proud of me? LOL I love both tops with your denim shorts. They look great. I hate having to dress for sweltering heat outside and freezing air conditioning inside, which is basically impossible. I really like the pattern of the first shirt, and is there a subtle pattern in the second shirt too? It's more of a texture than a pattern - I really need to try get a better picture next time I wear it! Both of your outfits are really cute! When it gets hot here in Ohio I'll have to check out your blog for inspiration! Thanks all for your lovely comments!